If you are searching for a creative way to recycle your weekend wine bottles, look no further! 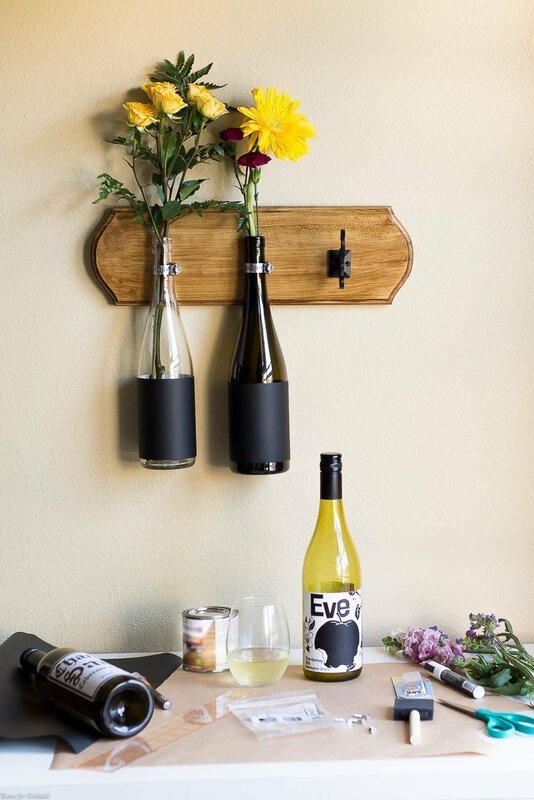 This DIY Wine Bottle Wall Vase Tutorial is just the thing you need to make with friends the next time you open a bottle of your favorite Washington wine. It’s no secret that around here it’s always Thyme for Cocktails! As much as I love to play mixologist though, most times we prefer to kick back at the end of the day with a bottle of our favorite wine. Paul likes a good Cabernet Sauvignon, while I tend to prefer whites, like a nice medium-bodied Chardonnay. There is almost always a bottle on hand in the kitchen since both come in handy in plenty of recipes, which is also why I love this DIY Wine Bottle Wall Vase Tutorial as a way to recycle our bottles. While I like to research a wine before buying it, Paul usually grabs a bottle based on how it looks. My dear SO recently brought home a bottle of Chateau Smith Cabernet Sauvignon simply because of it’s unique label! I was a little skeptical at first, until I did a little research and fell in love everything about these wines. Charles Smith debuted his first wine in 2001 had has been a two time winemaker of the year recipient. He is currently the only person to have won Winemaker of the Year by both Food & Wine (2009) and Wine Enthusiast (2014). The fact that he is a former rock band manager only made him cooler in my husband’s opinion! Washington state, with more than 900 wineries and 350 vineyards, is home of the Charles Smith Wine collection. 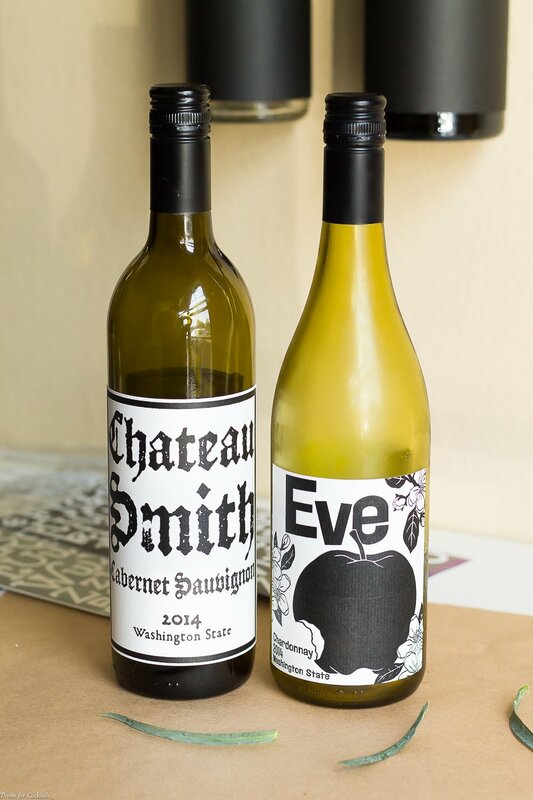 August is Washington State Wine Month and I couldn’t think of a better way to support local award-winning brands than with our two favorite varietals the Chateau Smith Cabernet Sauvignon and Eve Chardonnay. Chateau Smith Cabernet Sauvignon is a 96% Cabernet Sauvignon, 4% Merlot blend. This full-bodied, aromatic, dry red wine has classic flavors of blackberry and cassis with mineral notes of graphite. 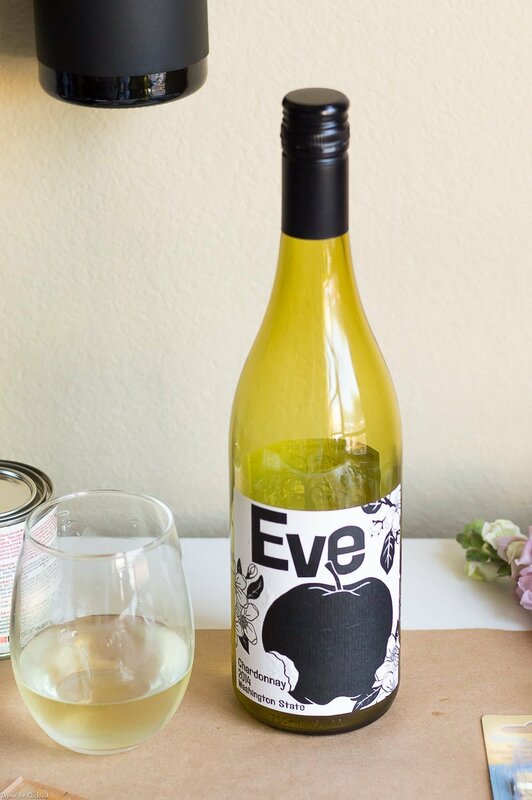 Eve Chardonnay is 100% Chardonnay. It’s a medium-bodied, juicy, dry white wine with flavors of pear, tangerine and guava, but more than anything, true Chardonnay flavor with a vein of minerality running through the middle. You can find out more about Washington Wine Month by following the hashtag #WAWineMonth on social media and visiting www.WaWineMonth.com. 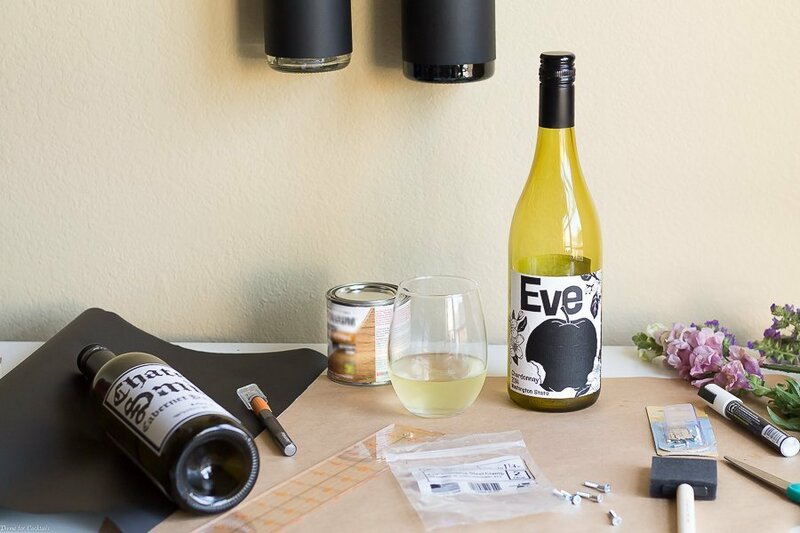 A gal pal and I decided to make this DIY Wine Bottle Wall Vase Tutorial while sipping on a bottle of Eve Chardonnay in the spirit of recycling. I have one hanging in our room and she was dying to make one for her new apartment. 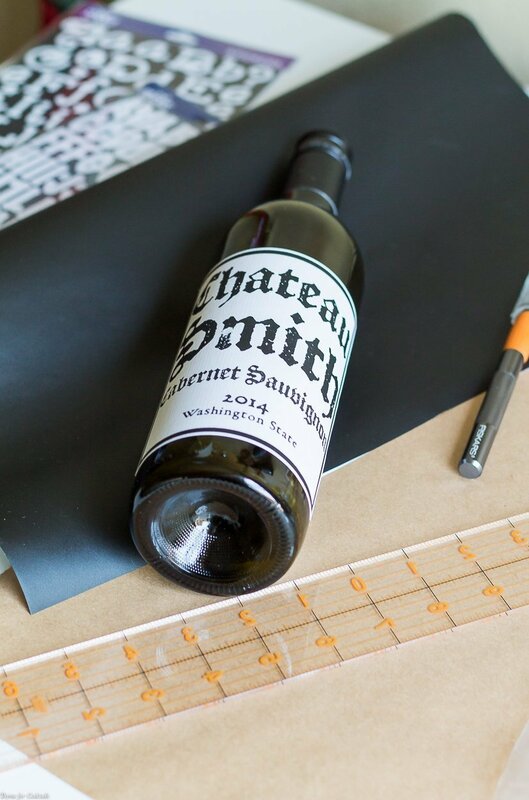 We shopped for supplies, grabbed the empty bottle of Chateau Smith Cabernet Sauvignon from last weekend, and got to work. This tutorial is very easy to do and would make a great party activity the next time you get together with friends. 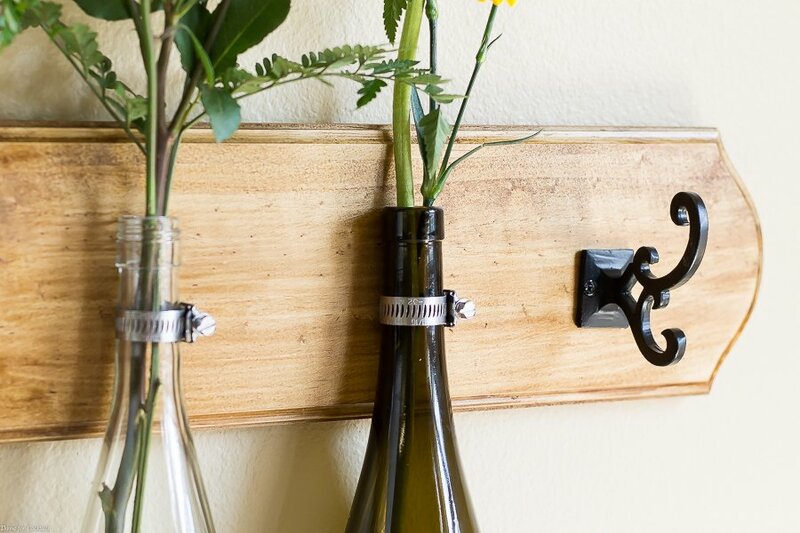 All you need is a couple of empty wine bottles, a piece of wood to mount them on, and a few basic pieces of hardware. Paul is my usual DIYer, but we ladies had no problems at all completing this one on our own. 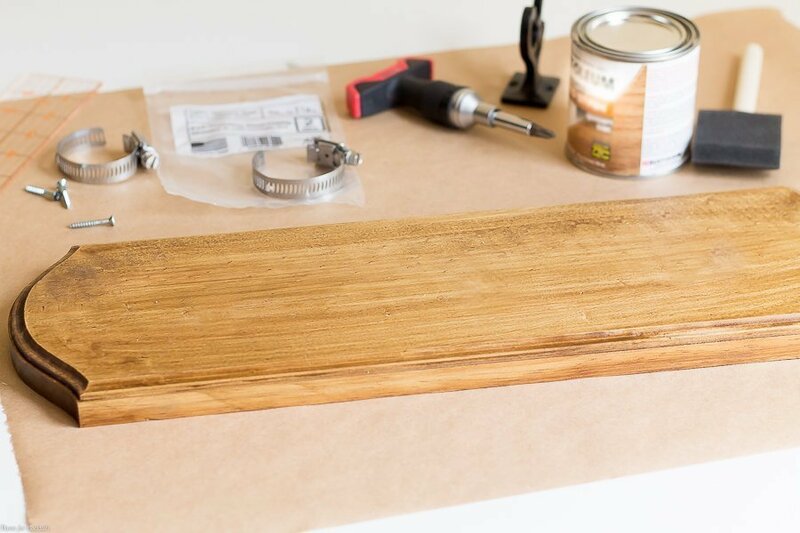 I am going to show you the steps we took to complete this DIY Wine Bottle Wall Vase Tutorial, but keep in mind that exact measurements and hardware size is going to vary depending on your board. We also added a hook for keys, jewelry, or anything else you might want to hang up. You really can customize this project however you want. Three bottles would be cool, or maybe one bottle, a hook, and a small mirror. The possibilities are endless! Select your base and stain if necessary. We decide to stain a plaque similar to mine for this particular project, but you could use any number of items instead. Think reclaimed lumber, a unique cutting board, or even a decorative wooden sign with your favorite wine related saying! Just make sure it’s sturdy enough to hold your bottles! 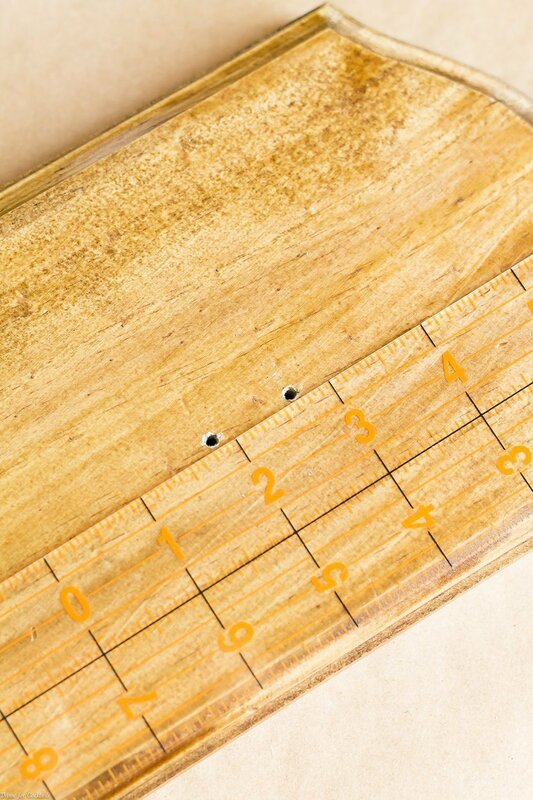 Measure and mark holes for your hardware. 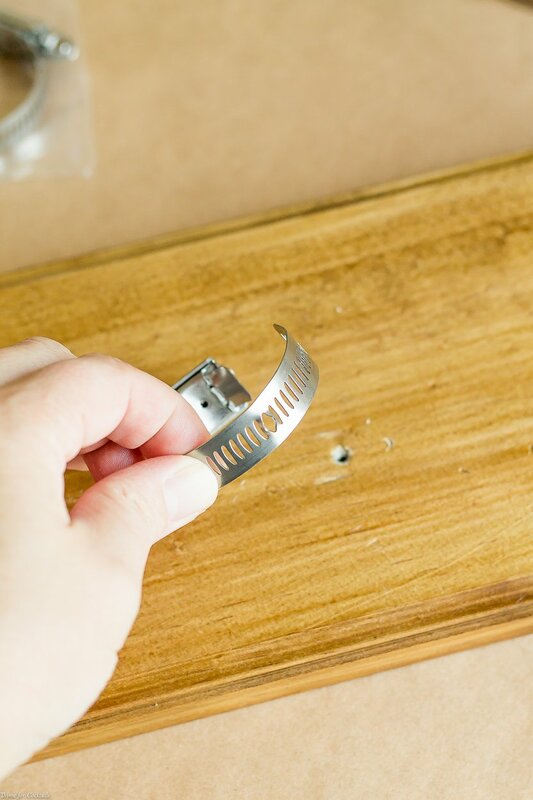 I recommend pre-drilling holes or using a nail to create a ‘starter’ hole for the screws. This make attaching the clamps much easier. You also want to attach picture hooks to the back of your board so you can mount it on the wall. Select the largest hooks you can use to support the weight. 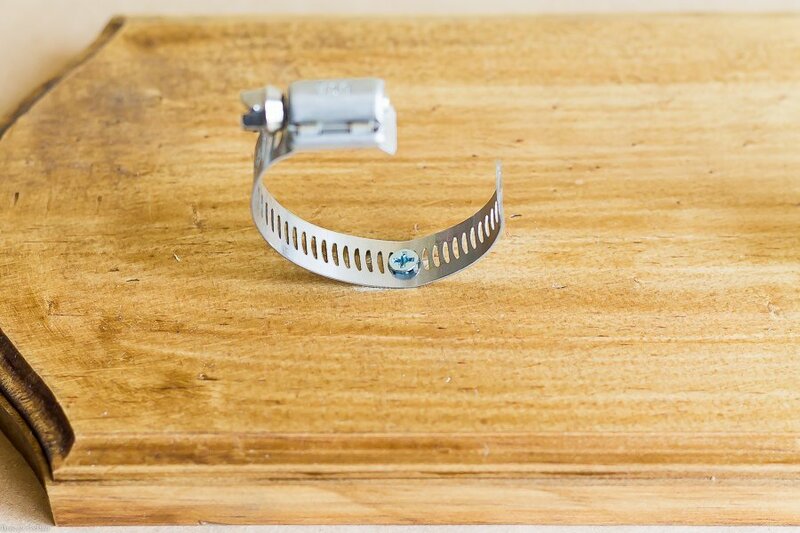 Punch holes in your clamps for the screws. I am sure Paul could tell you about a fancy tool to do this, but to be honest we simply used a hammer and a large nail. Just be sure you aren’t actually nailing it to a surface! We were able to make it work on a thick rug. Use sturdy screws to attach the clamps to your board. Be sure they are secure enough to hold the weight of the wine bottle PLUS whatever you are going to put in the bottles. Decorate your recycled wine bottles. You can remove the labels and wrap with twine or sisal. Paining them is another fun option. We used chalkboard contact paper which is a great way to really customize this DIY Wine Bottle Wall Vase Tutorial. This project also makes a great housewarming gift. Just put together a basket with all the supplies, plus 2 unopened bottles of Charles Smith wines! This is the fun part! 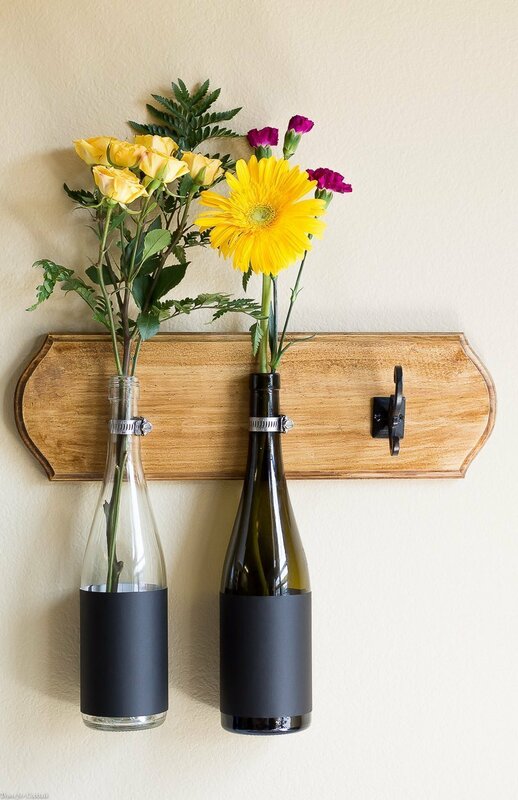 Attach your decorated wine bottles using the clamps and fill the vases with your favorite flowers or herbs. You can also regrow certain vegetables like scallions this way! I hope you enjoy this DIY Wine Bottle Wall Vase Tutorial as much as we did! I love that it is such a simple ‘everyday’ project, just like Charles Smith wines.